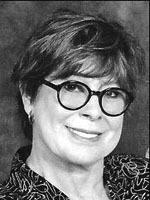 Suzanne Grossman appeared in Broadway productions during the 1960s, and was an accomplished screen writer. She wrote several episodes of Ryan's Hope. I really enjoy Suzanne's voice acting and the episodes she did. I thought she was in "The Ideas of March" also (the one where the wife has a precognitive dream about her husband dying in a plane crash and tries to stop him from going on a business trip). I wish she had done more episodes as I really enjoy her voice.